The American Heart Association reports that 35.7 million adults in the United States suffer from high cholesterol levels, defined as a total serum cholesterol of 240 mg/dL or greater. Because high blood cholesterol levels increase your risk for heart disease, you should understand the factors that contribute to high cholesterol to make healthy lifestyle choices to keep cholesterol levels low. Animal cells produce cholesterol, which means that only foods derived from animals contain dietary cholesterol. Nuts, including cashew nuts, do not contain cholesterol. The cashew nut grows on trees that thrive in the regions around the equator with Brazil, Mozambique and Vietnam the principal producing countries. The fruit of the cashew tree resembles an apple with bright yellow to red skin. The cashew, a kidney-shaped nut, hangs from the apple protected by a hard shell. Although cashews contain a significant amount of fat, they make a good snack choice for their high protein content, 4 g per 1 oz serving, vitamin and mineral content and cholesterol-free status. Because the majority of the fat is "healthy" fat, eating tree nuts like cashews may help lower blood cholesterol levels. Cholesterol is a waxy, fat-like substance necessary to provide structure to cell membranes, produce hormones and make bile acids needed to break down fats during digestion. Cholesterol travels through the bloodstream packaged with specialized proteins known as lipoproteins. Low-density lipoprotein, known as LDL, carries the majority of the cholesterol in the body and keeps cholesterol bound so that it stays in the blood vessels. High-density lipoprotein, which binds to only 1/4 to 1/3 of the cholesterol in the body, carries cholesterol to the liver, which breaks it down and removes it from the body. High blood cholesterol levels, due to increased production within the liver or increased intake of dietary cholesterol, promote the accumulation of cholesterol along the walls of the blood vessels, which restricts the flow of blood and leads to heart disease. Foods contribute 25 percent of the total cholesterol in the body, with the other 75 percent produced within the body. Although consuming dietary cholesterol contributes to an increase in blood cholesterol levels, eating high levels of certain types of fat actually affect cholesterol levels more. Saturated fat, the type of fat that remains solid at room temperature, causes LDL cholesterol levels to increase. Trans fat, like those fats created by adding hydrogen, increase LDL cholesterol levels and also decrease HDL cholesterol levels. Cashews contain no trans fat and very little saturated fat, with 3 g per 1 oz serving, so they produce no negative influence on cholesterol levels. The unsaturated fats, which include polyunsaturated and monounsaturated fat, can actually help to lower blood cholesterol levels giving them the distinction of "healthy" fats. Nuts in general are a good source of unsaturated fats. 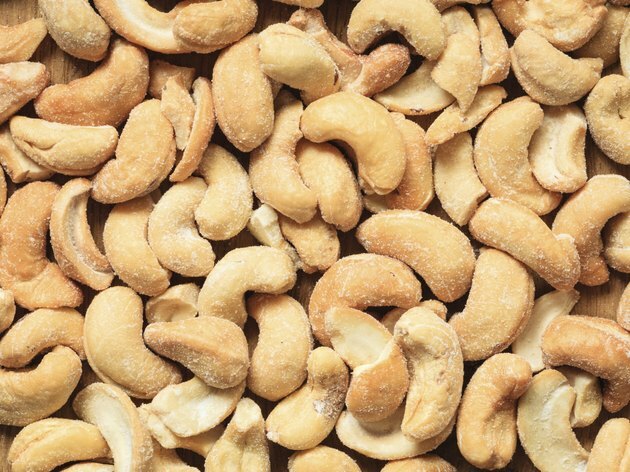 A 1 oz serving of cashew nuts contains 8 g of monounsaturated fat and 2 g of polyunsaturated fats. Eating cashews as a part of a low-fat, low-cholesterol diet can help to lower the risk for heart disease.